Swindon’s best business leaders have just a few days left to enter the South West’s most prestigious awards for boardroom excellence and enterprise. The deadline for entries to the prestigious Institute of Directors’ (IoD) South West Director of the Year Awards is midnight this Sunday. With two new categories added this year – Young Director and Director of a business with a £50m-plus turnover – the awards, which champion outstanding leaders and entrepreneurs, are set to be bigger and better. Over recent years the awards have been won by some of the region’s top business figures, who have subsequently gone on to represent the region in the national IoD Director contest. The awards are open to anyone working at director level in any type of business or organisation – they do not have to be an IoD member. A panel of experts will judge the entries and the winners will be announced on June 5 at a ceremony at the Haynes International Motor Museum, near Yeovil, Somerset. Other categories are Start-Up, Small-to-Medium (up to £50m turnover), Public Sector, Not for Profit/Third Sector, Innovation and Corporate Responsibility. There is also a Chair’s Award for Excellence and a Best Director in Board Practice category. Swindon Business News and its sister titles Bath Business News and Bristol Business News are once again media partners for these coveted awards. IoD South West chairman Muir Macdonald said the awards were about amazing leadership – recognising it, showcasing it, rewarding it. “It’s been an uncertain – if not a challenging – time for us all recently yet the South West continues to remain resilient and resourceful, thanks in no small part to its people and their leaders. “This is a great opportunity for anyone who accomplished great things in 2018 to shout about it,” he said. South West winners are eligible to go forward to the UK Director Awards in London in the autumn. The entry form and more details are available at http://www.iodawards.com/southwest. New Director. 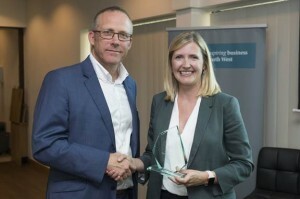 UWE Bristol pro vice-chancellor Donna Whitehead, pictured above receiving her award from IoD South West chair Nick Sturge. Corporate Responsibility (CSR). Rob Vivian, CEO of Clevedon and Cornwall telecoms provider Pure Comms. Innovation. Dr Anil Ohri, founder and chief executive of Downton, Wiltshire-based Regent’s Park Healthcare. Public/Third Sector. Alison Jordan, CEO of Exmouth-based Pete’s Dragons, a bereavement support service for those affected by suicide in Devon and Cornwall. Family Business. Rebecca Marks, co-founder and MD of Newton Abbot-based global entertainment agency Scarlett Entertainment. Start-Up. Oliver Bruce, founder and managing director of PinPointMedia in Cheltenham. Reach tens of thousands of senior business people across Swindon & Wiltshire for just £70 a month. Email info@swindon-business.net for more information. Copyright © 2019 SWINDON BUSINESS NEWS. All Rights Reserved.